I’ve read a lot of old religious texts over the past year* and have enjoyed many of them. I’ve read about faith and about violence, I’ve read of love and hatred, I’ve read of both compassion and condemnation. I’ve read about the effects religiosity has had on different peoples at different times, and I’ve learnt a lot about the problems of contemporary society that are commonly perceived to be the result of lost spirituality. Plagued by Catholic guilt but with no belief in forgiveness or any kind of deity, I’m a strong example of someone who has really imbibed the least useful bits of religion – I feel bad for many things, yet feel good because of pretty much nothing. Does that make sense? No, no it doesn’t. However, I like reading about people who do have that hole in their life filled, who do feel it’s possible to believe in a purpose and a point of existence, because I envy their ignorance. ** I like the idea of being able to see life as something of value, but I know that in order to do so I’d have to be heavily brainwashed and I don’t want to risk the loss of knowledge/memory that could occur simultaneously. I’m not looking to be converted, in fact I actively want to not be converted. But that doesn’t mean that I’m not able to enjoy the awe and the magnificence of beautifully written spiritual prose. I’ve read St Augustine, I’ve read lots of the Bible, lots of apocrypha: so far only Christian and Jewish texts, but I will probably widen my scope. 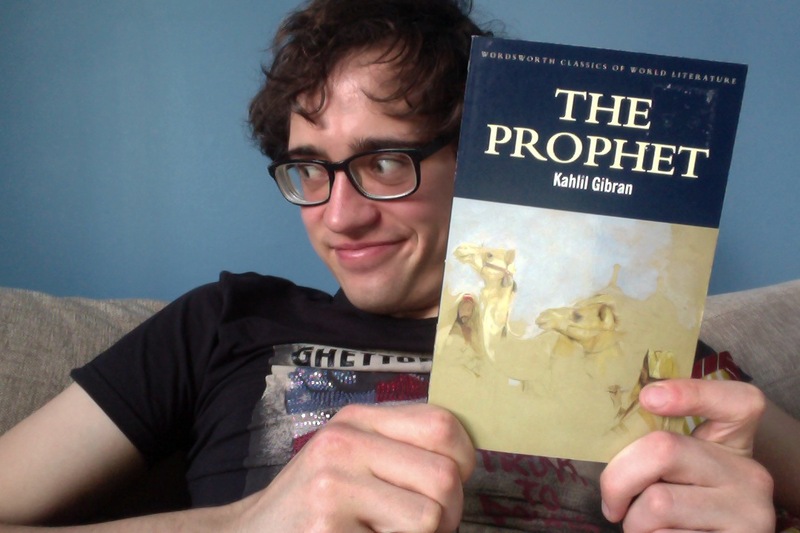 Kahlil Gibran’s The Prophet, though, is another Christian text. But different from all of the others in that it is under than a hundred years old, rather than ancient. There felt to me something a little delusional about writing like this in the 1920s. There is deliberate archaism in the language (it is modelled on the King James Bible), but I think that was essential in order to match with an archaic mode of expression. The text (60 pages) offers the speech of a prophet as he is leaving a town. He speaks on (I think) 26 topics, ranging from Love and Prayer through to Clothing and Time. Some are abstract, others very literal. The language is nice, I suppose, but the piece about Friendship feels like the kind of thing that would be crocheted onto a cushion, and all the talk of “God” and “souls” is a bit saccharine, too. God as a concept was dying in the first half of the 20th century, and the texts from the ’20s that I love (Virginia Woolf, DH Lawrence, etc) take an important humanist step by considering the psychology and the physicality of their subjects, rather than their spirituality. Gibran’s text, for all its pretty poetry and some nice, positive, non-judgemental messages, feels a little bit late. Is this my prejudice, though? Can I forgive writers and thinkers from believing in gods only if they’re Renaissance or earlier? I don’t think it is. I think Gibran’s text, if published just 20 years earlier, would have felt more relevant – it’s very 19th century, in essence, even if it a little more forgiving than the previous century was. A nice idea, but I didn’t rate the book and I shan’t recommend it. If you want Christian spirituality written in this style, look to the Bible. I might go so far as to describe The Prophet as pointless. Maybe. * I’ve been working on a novel about John the Baptist. ** And it is ignorance. Life is pointless. We are trapped within it, urged by electrical reactions in our brains to do nothing but reproduce and not die for as long as possible. There is no meaning, there is no point, there is nothing. There is only death and decay waiting for us ahead. There is no light at the end of the tunnel. There is no tunnel. There is only an end, and it will be messy and it will smell. Can you share more about what you read on St. John the Baptist?